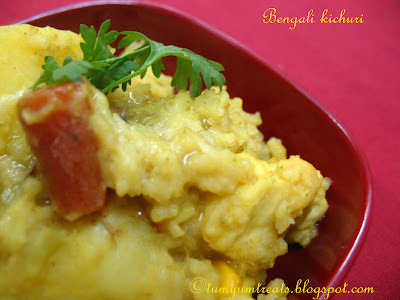 This is my second entry to Sandeepa's (Of Bong Mom's cook book)RCI Bengal. 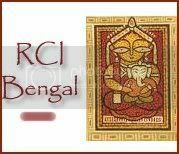 Here is the RCI Bengal logo - It conveys the spirit of Bengal at the first glance. Beautiful logo! Parvati Devi with little Ganpati Bappa! Babumoshai - as in 'Anand', Rajesh Khanna in 'Amar Prem' - 'Pushpa, I hate tears', Calcutta Kali, Durga Pooja, Aparna Sen, Sandesh, Rasgulla, Bengal tigers, Swami Vivekananda and......of course Sabita Aunty!! When my father was posted at Chennai, we had Bengali neighbours - Mr. & Mrs.Das a.k.a Sabita Aunty. She used to speak Hindi with a heavy Bengali accent. On one occasion she called me to taste khichdi. I wondered what could be special about 'khichdi' of all things - I hate moong dal khichdi!! I did not want to appear rude [I am glad I wasn't] so I just had a little , and it was so tasty that every time after that whenever she made khichdi she would let us have some. Das Uncle got transferred from Chennai some time later. Their things were all packed and sent off except for a few essentials. The evening before they left, I mentioned how much I would miss their 'kichdi'. Aunty was such a sweet lady, she actually cooked it that night and made us all have it! Todays post is dedicated to Sabita Aunty. I looked up the recipe in 'Special Vegetarian Delights' by Kamal Mehta, but reduced the quantity of spices and changed the recipe just a little to adapt it my taste. Turmeric powder / Haldi - 1tsp. Clean, wash and soak the dals and rice separately for 10 to 15 minutes. Heat 2tbsp. ghee in a pressure cooker or open heavy bottomed vessel. Add all the dry spices. Fry for a minute and add the onions. Fry till it is golden brown. Add drained rice and dals. Fry tossing well for about 4 to 5 minutes. Add 6 cups water. When the water boils add the vegetables and open cook for 5 minutes. Cover with the lid, put the weight on. After two whistles, reduce to sim and let cook for 5 minutes. Put off fire. Let the cooker cool completely. Add 2 more spoons of ghee/oil. Mix well without breaking the vegetables and garnish with coriander. 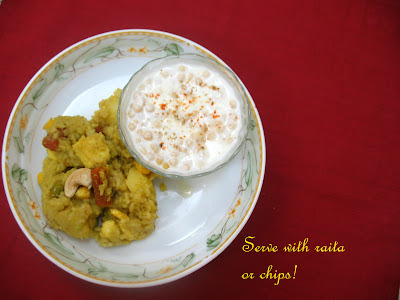 Serve with chips and raita. It is a filling and nourishing meal by itself.